Allow communication over usb cable. Add a blank file under /boot called SSH. 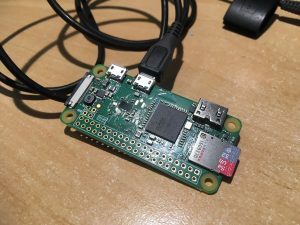 touch /Volumes/boot/ssh, this will allow us to SSH to the device as the latest version of raspbian disables this by default. Now we have a base build that will allow you to interact with it via USB ethernet and SSH it’s worth taking a back up so you can easily role back at any point. In my case the pi got a DHCP IP address which also provided a default gateway, if your setup differs you might need to enable IP forwarding on your host as well as setting a default route. In order to get responder going we need a few packages, as we have a working internet connection now well do it now. We’ll finish off sorting out auto launching responder later. So that you can remotely access the pi the next thing we need to do is configure the wireless card into AP mode using hostapd and dnsmasq. We also need to tell hostapd where to look for the config file when it starts up on boot. Open up the default configuration file /etc/default/hostapd and find the line #DAEMON_CONF=”” and replace it with DAEMON_CONF=”/etc/hostapd/hostapd.conf”. So now we have a working hotspot running on the pi, a quick shutdown -r now should reboot the device and allow you to connect. What we now need to do is configure the Pi to provide a DHCP service on usb0, we already have dnsmasq installed so we’ll simply use the same service and just configure it for usb0. Don’t forget to disable internet sharing on your MacBook so that it uses DHCP on the usb ethernet device. It’s also worth mentioning that you could now use the wifi hotspot and the compromised machine as a pivot point into the network from outside. Creds to other blog posts who helped me with this are AdaFruit, Frillip and Th3 S3cr3t Ag3nt.